As a Filipino, I can't help but boast a bit about our National Hero. 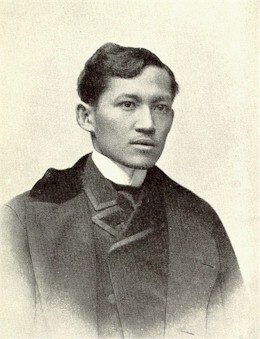 His name is Jose Rizal, poet, novelist, architect, cartoonist, businessman,educator, economist, ethnologist,opthalmologist,scientific farmer, historian, inventor,journalist,sculptor, psychologist,sociologist,musician, and linguist. He was also an expert swordsman and a good shot. Born in Calamba, province of Laguna, on 19 June, 1861 to Francisco Mercado and Teordora Alonzo, he was the 7th child in a family of 11.He showed his genius at an early age. At 3, he learned the alphabet and by 5, he could already read and write.He wrote his first poem at the age of 8.At 16, he finished his Bachelor of Arts degree with the grade of "excellent" in Ateneo de Manila.After this he took up Philosophy and Letters at the University of Sto.Tomas in Manila, simultaneous with courses leading to a degree of surveyor and expert assessor in Ateneo. Arabic, Catalan, Chinese, English, French, German, Greek, Hebrew, Italian, Japanese, Latin, Malayan, Portuguese, Russian, Sanskrit, Spanish and Tagalog. He published 2 great novels in his lifetime which became the symbol of the struggle for unity and freedom among the Filipinos, they were NOLI ME TANGERE and EL FILIBUSTERISMO. Towards the end of his life, he was accused of inciting his countrymen to rebellion and heading the secret organization Katipunan ( outlawed by the Spaniards because of its seditious nature).These were false accusations but he was jailed no less and later shot to death for crimes he did not commit.He died at the age of 36 on 30 December, 1896. Rizal was way ahead of his time. He was a genius and even then he was recognized and revered as such. He liked strong women and wrote to his family about the strength of German women (and if only Filipino women could emulate such character!). He built his own school , farmed the land that he bought in Dapitan, Mindanao and lived-in with his girlfriend at a time when it was unheard of and unthinkable to do such a thing (the Philippines then being under Spanish rule was 95% a strict Catholic country ).Rizal defied the Spanish priests for being hypocrites and siring bastards with Filipino women clandestinely. He also wrote against priests who amassed wealth by owning Philippine lands illegally.He became a Mason because of this and suffered the consequences for his act of defiance. For such a small third world country as us, it is indeed an enormous honor and prestige to have a hero of this great caliber. If there's any blessing given to us by the heavens, it is that we have such an intelligent ,passionate and compassionate man for a national hero! I just hope that this inspires us to achieve more and be better than what we are today..Sadly, the Philippines now doesn't seem worthy enough to be represented by a Rizal.The poor man will be turning in his grave if he sees what has become of his beloved country.